Platinum Card Membership has its rewards. We value your loyalty and look forward to continuing to serve you in the coming year. To show our appreciation, we are pleased to offer you this complimentary Amazon Echo, a wireless, 360-degree immersive sound speaker that responds to your voice. Thank you for being a valued Platinum Card Member. We hope you enjoy your gift. American Express sent him a Amazon Echo just for being a cardholder! 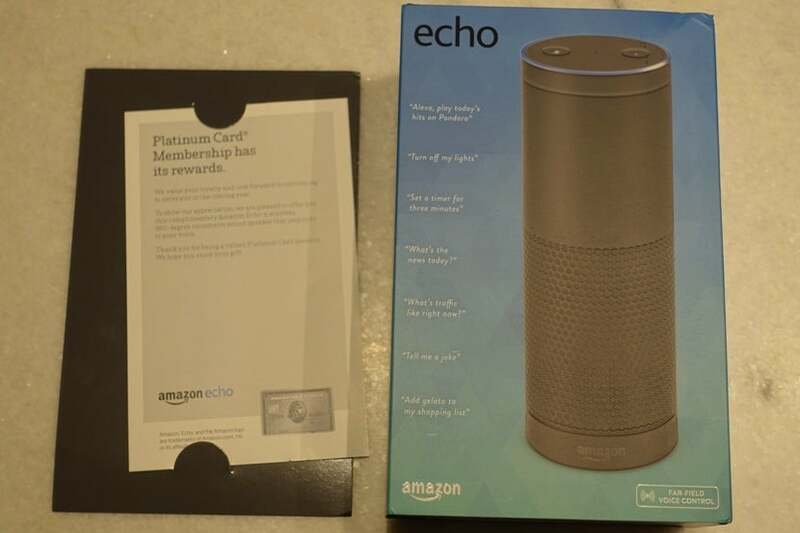 Since many of us on the TPG team have The Platinum Card from American Express, we checked around to see if anyone else had received an Amazon Echo — even waiting a few days in case ours was delayed in shipping. No dice. But he wasn’t the only one to report getting an Echo from American Express. Cardholders took to Twitter to share their thanks to Amex for the unexpected gift. While it would make sense to send these gifts to cardholders that charge a lot, the TPG team member reportedly doesn’t even spend that much on his Amex Platinum. Surely Amex has some rhyme or reason to how it’s dishing out these gifts, but it seems to be based on something other than just amounts charged. Although you aren’t guaranteed a Christmas gift from American Express, there are plenty of benefits that you’re guaranteed to get from the Amex Platinum: 5X Membership Rewards points on airfare, access to American Express Centurion lounges and a slew of other lounges, elite status with Hilton and Starwood, and Global Entry fee credit — just to name a few. And with The Business Platinum Card from American Express OPEN, you’ll also get a 50% rebate on points redeemed for premium cabin flights and free Gogo Wi-Fi passes. Finally, remember if you’ve already got either version of the Amex Platinum, you have just six more days to finish off the $200 airline fee credit. Have you received any gifts from a credit card company?